Why isn't War Machine a member of the movies' Avengers? I mean, when you think about it, he's basically Tony Stark, in terms of battle capability. Hell, he even shows up to their parties. So why isn't he? Tell you what, while I ponder this, you stare lovingly into the eyes of mini-Don Cheadle here, the latest Hot Toys figure. Yes, War Machine may not be a technical movie Avenger, but that doesn't mean he can't show up in Hot Toys line of Age of Ultron toys — he's showing up before Vision, Quicksilver and Scarlet Witch! The 1/6 scale figure is of the Mk II armour, the one also worn in Iron Man 3 — and coincidentally, the last time Hot Toys made a Rhodey figure. So what's different about this new one? Honestly, there's only one real difference: The appearance of Don Cheadle's face. Otherwise, this War Machine is essentially the same — same rotating cannon on his minigun, same extra hands, same light up LEDs in the helmet and chest areas. 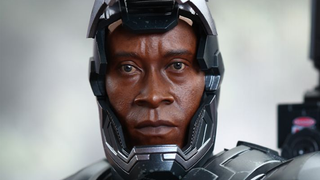 The only new things are an Avengers-themed stand and the above open face mask, revealing the fact that this time Hot Toys got the likeness rights to Don Cheadle. Huzzah! Despite the fact it's not exactly new (hey at least Tony had different suits to show up in), it's still a damn fine toy. It's even actually made of diecast metal in some places too, giving the figure an appropriate metallic weightiness, suitable for a toy depicting a guy in a suit of iron armour. War Machine will be out later this year, for an as yet undisclosed price — US preorders will be available from Sideshow when they update the site within the next day or two. But you can expect the usual Hot Toys amazing toy tax of around $200-250.